This is the swap that Deb brought. Isn't it just so springy! I love it! You could tuck all kinds of treats in here. And she used all three stamps from the Yummy set on it! Great job Deb! 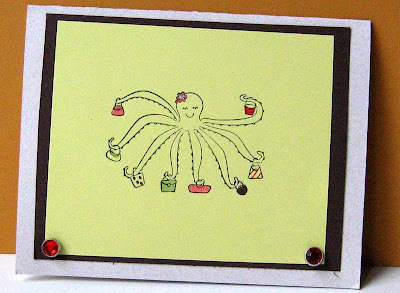 This is the front of Elli's card and I can't remember the name of the set, but I think it is retired. Just adorable! And Elli had a purse party on Sunday, so it was totally appropriate, lol! She even did the inside of the card and colored all the purses. Love all the details ladies, you both made lovely cards! I hope this inspires the rest of you to participate in the card swaps each month. Three people will be able to swap for these cards next month as there are some left. I got a very lovely surprise in my mailbox today. This card from Kathy Nadon! For those of you who have never heard the term RAK, it means Random Act of Kindness and this certainly was. 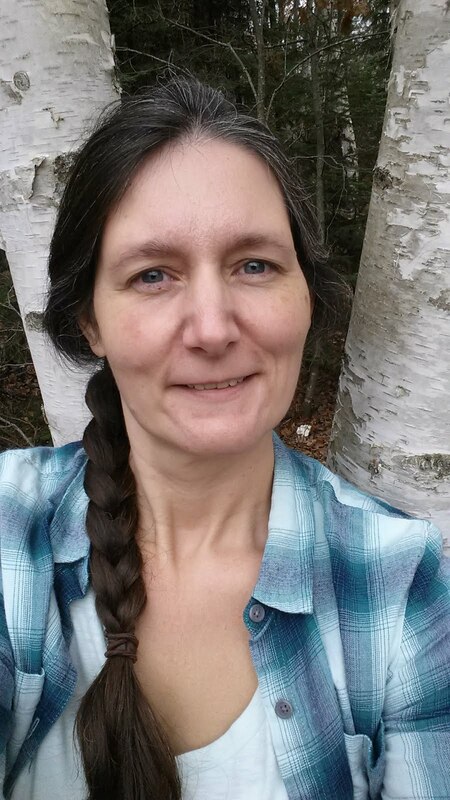 Kathy, I have thought of you often and smiled also! Thank you for this great card! 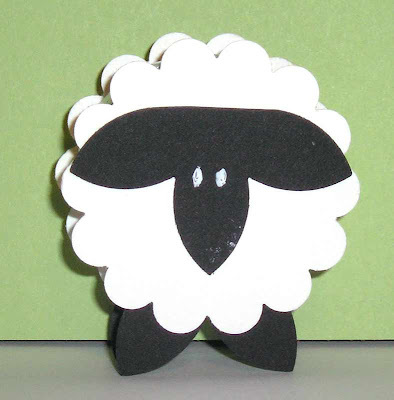 Remember our little lamb from Club? Well I made a friend for him. 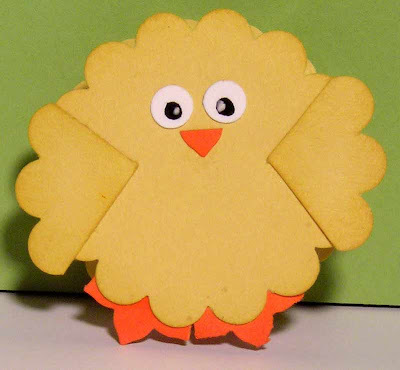 I changed someone else's idea a little to fit the punches I have, and came up with this little chick. Isn't he cute?! Here is a close-up of the little fella. I'll do a quick tutorial here also. Punch out 3 scallop circles in So Saffron. From one of the scallops, cut 2 3 scallop wedges for the wings. Sponge all edges with So Saffron ink. Adhere wings to 1 scallop circle as shown above. Punch out two 6 petal flowers with the Boho Blossoms punch. Cut it in half to make the little feet. Adhere to winged scallop circle as shown. Cut 1 petal off of the other flower. Adhere as shown above for a beak. Punch out 2 white standard hole punches. Adhere to chick as shown. Use black marker to make pupils, and use white gel pen to add highlights to eyes as shown. Adhere scallop circles to front and back of peppermint patty. Punch 2 white scallop circles. Punch one 3 petal section and two 2 petal sections in black with 5 petal punch. 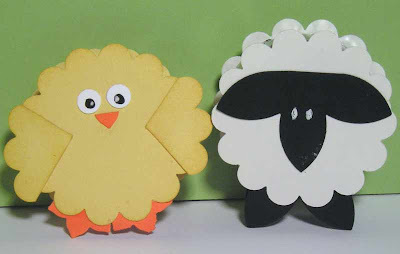 Adhere 3 petal section to 1 of the scalloped circle to make the face and ears of the lamb. Adhere the 2 petal sections to the bottoms of the scallop circles to make the feet. Draw eyes on the face with white gel pen. Adhere to peppermint patty using tape runner. All done! Now isn't he cute?! And doesn't he need some friends? Make a few more to share with everyone! This is the scrapbook page we did. Can you tell I was in the mood for spring? I also went a little crazy with the embellishments, but hey, it's a fun page. Accessories: Filigree designer brads, Square Rhinestone brads, silver eyelets, Hidden Garden rub-on, So Saffron & Certainly Celery 5/8" ribbon (Sale-a-bration), Pretty in Pink, Bashful Blue, Certainly Celery, and Elegant Eggplant 1/4" ribbon. Stamp flower repeatedly over Almost Amethyst page in same ink. Sponge edges of page with Almost Amethyst ink. Adhere Close to Cocoa strip to a piece of Certainly Celery paper, run thru BS with Top Note die. Apply rub-on to bottom portion of Top Note die cut. Sponge edges with Almost Amethyst ink. Use Dotted Lines JW to create journaling lines in Certainly Celery ink on the Top note using the Wheel guide to keep it straight. 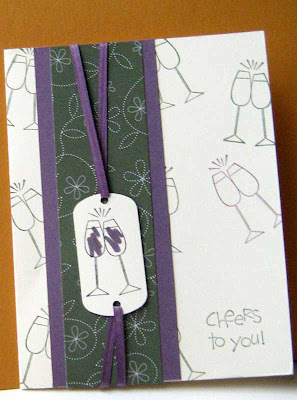 Adhere ribbon to 2"x2.5" piece of cs with SNAIL adhesive (tape runner), covering entire piece. Run thru BS on the smallest butterfly on the Beautiful Butterflies die. Singe edges of ribbon butterfly with a lighter to prevent fraying. Use Crop-A-Dile to apply silver eyelet in the center of the butterfly. Cut a 4"x12" piece of Delicate Dots DSP. Adhere a strip of So Saffron ribbon down the center lengthwise. Adhere to center of the Almost Amethyst page. Use glue dots to adhere butterfly to bottom of DSP strip. Adhere Top Note journaling block to the top portion of DSP strip. Use Paper piercer to poke hole for Rhinestone brad to make head for butterfly and apply brad. Use paper piercer again to apply Filigree designer brad centered between the Top Note and the Butterfly. Use Billboard Alpha die and the BS to make the title for the page with Almost Amethyst paper. 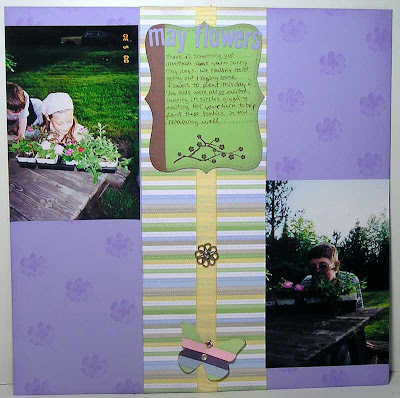 Place pictures on each side of DSP strip, and add your journaling. Stamp Tres Chic in Pink Pirouette on card front. Stamp Sanded in Sahara Sand on cardfront. Ink edges of card front in Sahara Sand. Distress edges of rectangular pieces of PP, SS, and WW. Ink edges with Sahara Sand. Adhere together. 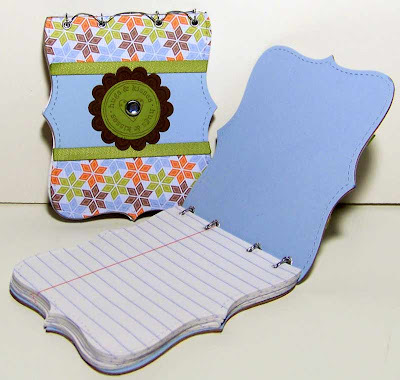 Use Paper Piercer and Mat pack to create faux stitching on matted rectangles. Use Sahara Sand marker to creat the "thread". Distress edges of WW and SS strips. Ink edges with Sahara Sand. 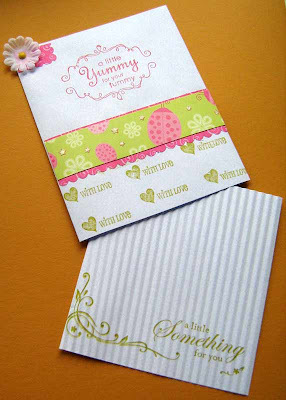 Use Stamp-A-Ma-Jig to center phrase on white strip in Sahara Sand. Stamp the small flower in PP and SS on each side of phrase- you can use the SAMG for this also. Rub embossing buddy over the Vellum. Stamp floral branch a couple of times in Versamark. Sprinkle with white ep and shake off excees. Heat with heat gun until EP melts. Allow to cool for a few seconds. Place face down on smallest butterfly on Beautifull butterflies die and run through the Big Shot. Fold butterfly in half. Apply a glue dot on fold. Apply to matted rectangle. Use Paper piercer to poke a hole for the silver brad that will make the butterfly's head. Apply brad. Adhere completed elements to the card. Take a 3" piece of ribbon, tie in knot. Apply glue dot to back, then apply to card. I have been goin nuts with this new Beautiful Butterflies die, I just can't seem to stop using it! I saw a card earlier today using Pink Pirouette and Going Gray that was gorgeous, so Pink was stuck in my head. But I wanted something softer, so I went with Sahara Sand. I love Sahara Sand and I have been neglecting you! But I guess I better buy some more before I gorge myself on it, lol! It's amazing how quickly I go through some colors. When I try to get out of my color comfort zone, I am usually not very happy with the result. Anyways! On to the card details! I have done 2 other butterfly cards today. Like I said, I am going overboard with the butterflies! I'll post them later. I just got back from conferences for one of my high school seniors and she got glowing reports. I'm a proud momma tonight! My daughter, Charlene, has more artistic talent in her pinky than I have in my whole body! And I'm not the only one that thinks so! 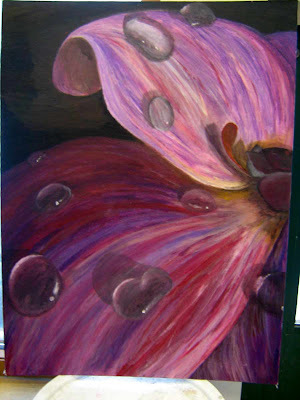 Here is one of her paintings. Spring is in the air and I'm dreaming of butterflies! 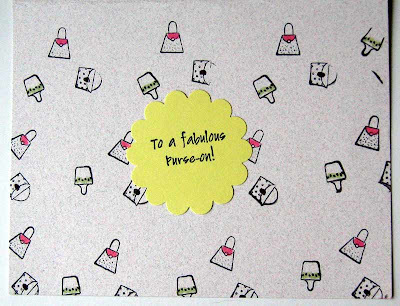 I see them dancing across scrapbook pages, perched on the edges of cards, fluttering over the refridgerator door. Of course, I am talking about paper butterflies, what else! 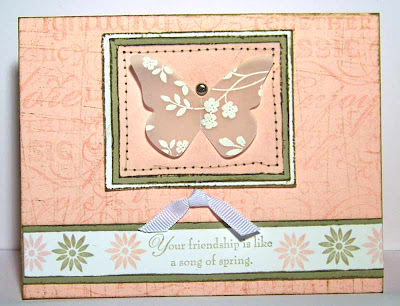 I just got the Beautiful Butterflies die from Stampin Up! a few days ago and came up with a great idea to add texture to them! Can you see what I did? 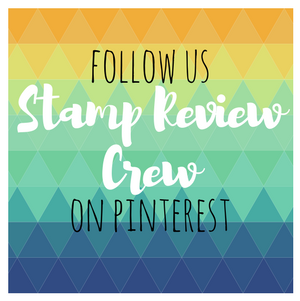 We are going to use these little beauties at Stamp Club this month. Maybe I'll send some home with you all and see what you all can some up with :) But isn't this just adorable! I can't wait to play more with this absolutely darling die. There are 4 different sizes of butterflies on it and it cuts through so many different materials the possibilities are endless. Ok, I have gone on long enough about the butterflies,lol! It's time to go see what else I can do! 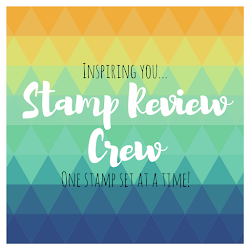 Don't forget, the next Stamp Club meeting is next week, March 12th at 7pm at Leah's church. Remember to bring your cards for the swapping fun! I made these little notebooks last month I believe, and just never got around to taking any pictures until tonight! I wanted to use some of that great paper from SU and thought the Top Note die really would make a cute notebook. 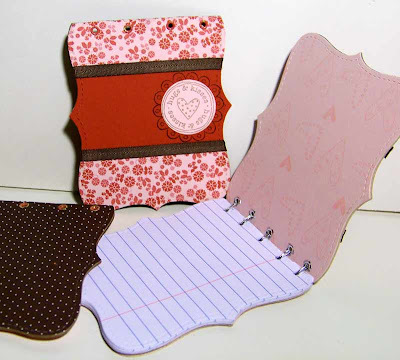 I used some Bella Rose paper for this one with Riding Hood Red and Pirouette Pink cs for these. The lines paper is from some old, not quite used up leftovers from the kids school notebooks from last year. You know how it is. There could be around 20 pages left in a notebook, nobody wants to use that notebook, but you can't see throwing it away! I just cut them up and ran them through the Top note die. I used our silver or gold elastic cord for the binding after using the Crop-A-Dile to make the holes and put eyelets in. These are done with SKi Slope DSP from the Holiday Mini. I paired it with Bashful Blue cs. Added a little bling with a rhinestone brad. The covers are cardboard from food packaging with the printed sides glued together with glue stick, then covered with DSP and CS on both sides. Totally a recycling project! Tell me what you think! ETA: pic of the binding- I have gotten alot of questions about how this was bound so here is a pic. 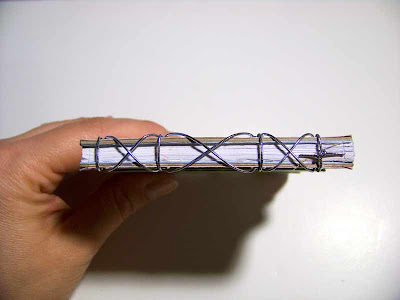 I basically took a length of elastic cord (about 3x the length of the notebook) threaded it through the first hole so that half of the length was hanging out each side. Put one side though the same hole, then criss-crosses each end into the next hole. then threaded the longer end through hole # 2 again. Repeat across to the end and tie in a knot. It was helpful to keep a paper piercer or a needle handy to keep the holes all aligned. And you need to be sure not to pull the cord too tight or the pages won't turn :) Hope these directions are helpful.